A customer in Telford recently bought this barn conversion in the village of Ince, Cheshire. 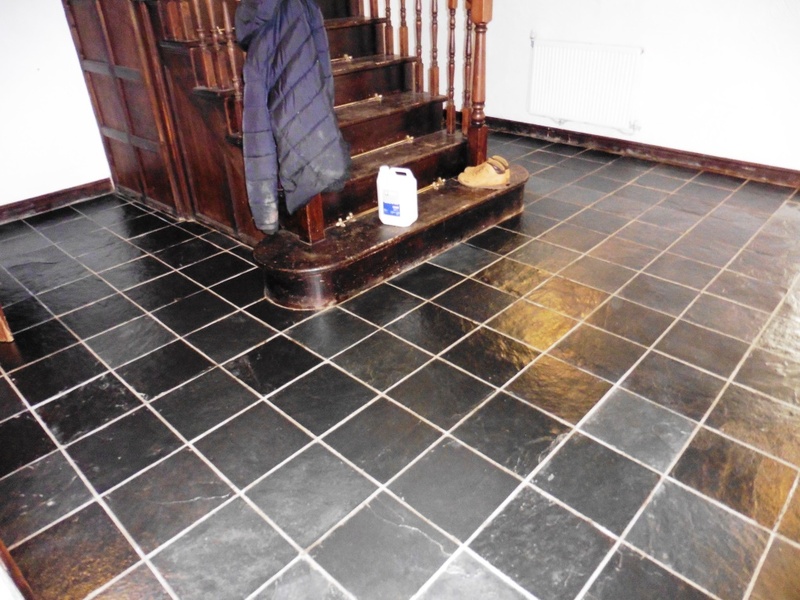 The building had Riven Slate floor tiles installed on the ground floor from hallway and corridor through to the utility room and downstairs WC. 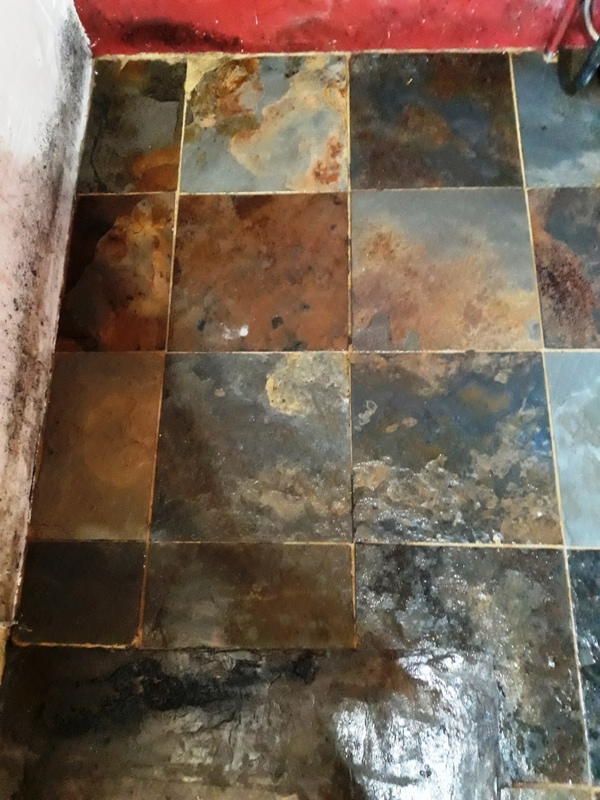 The tiles were not looking their best and in fact the old polyurethane based sealer had gone yellow and started to peel off in places. 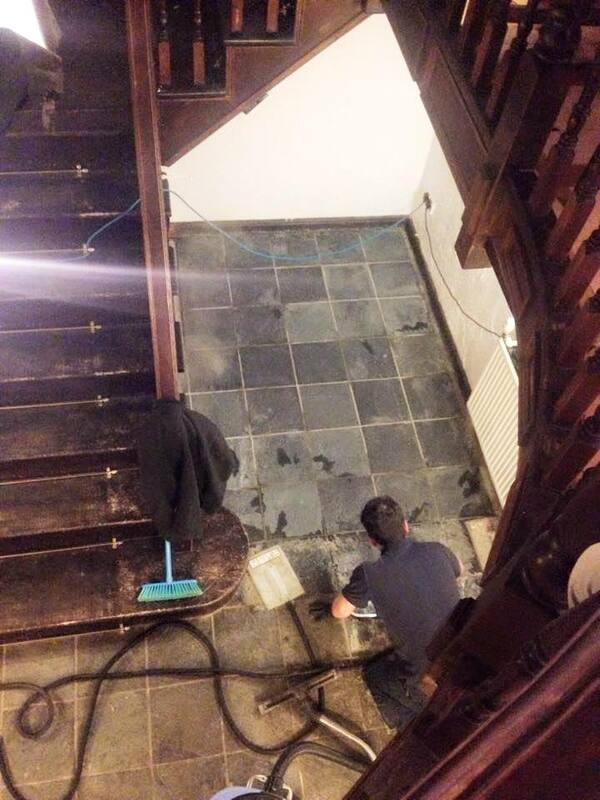 The building was originally built in 1886 and is grade 2 listed and after an initial attempt to bring the floor back to life didn’t work out as planned the owner decided to get in touch. 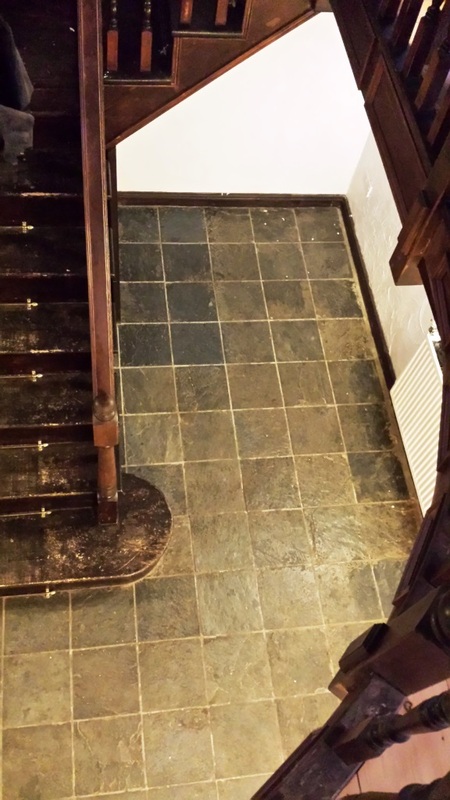 To get the floor back to its original state so it could be re-sealed the old sealer would have to be completely removed from the tiles, fortunately we have a product available that does exactly that called Tile Doctor Remove and Go. Working in sections the tiles were covered with a dilution of Remove and Go which was left to soak into the slate for twenty minutes before being scrubbed in used a rotary machine fitted with a stiff brush head. The resultant soiled solution was then removed from the floor using a wet vacuum and the process repeated until all the old sealer had been removed and the floor was looking clean again. Additionally it was necessary to steam clean the whole floor and scrub stubborn areas with a hand brush. After the whole floor was clean I gave it a thorough wash down with fresh water to remove any trace of cleaning product and then used the wet vacuum to get as much water off the floor as possible and reduce drying time. I left the floor to dry off for a couple of days and then returned to apply the sealer checking the moisture level of the floor first to ensure it was dry enough to take a sealer. I had discussed the various options for sealing and the customer wanted a satin finish so it was decided to use Tile Doctor Seal and Go which is a water based sealer that provides the require finish and being water based can be applied without leaving a solvent smell as it dries, four coats of Seal and Go were needed to fully seal the slate. It was quite a large area and originally I had estimated it would take two days to remove the old sealer and get the tiles clean in the end however it took three days due to clean the floor due to the state of the tiles and a day to seal. The customer and his wife were really happy with the result and left the following feedback for me on the Tile Doctor feedback system. 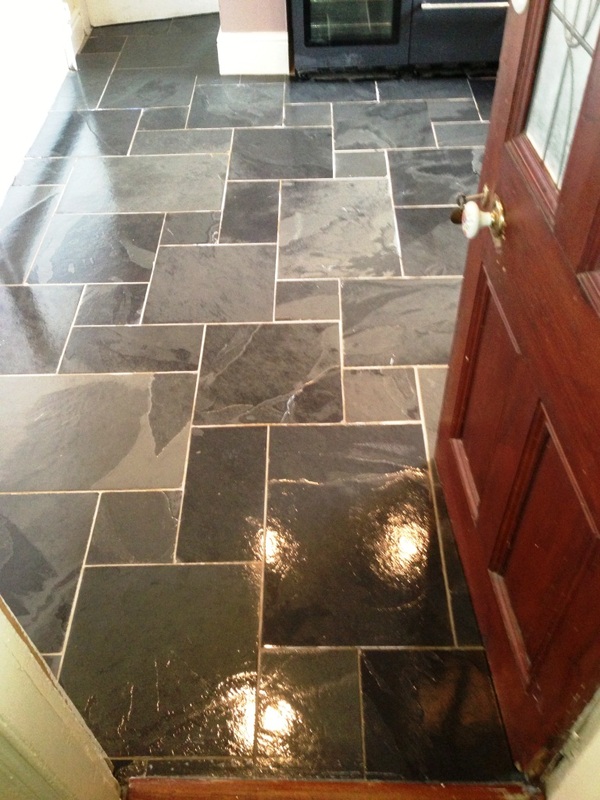 I would like to commend Jozsef on his hard work and tile doctor on their faith and training in there staff to achieve such a high standard in an end result. The experience from start to finish has been a very pleasant one. Jozsef was very professional, polite and punctual, knowledgeable, very hardworking and trustworthy. 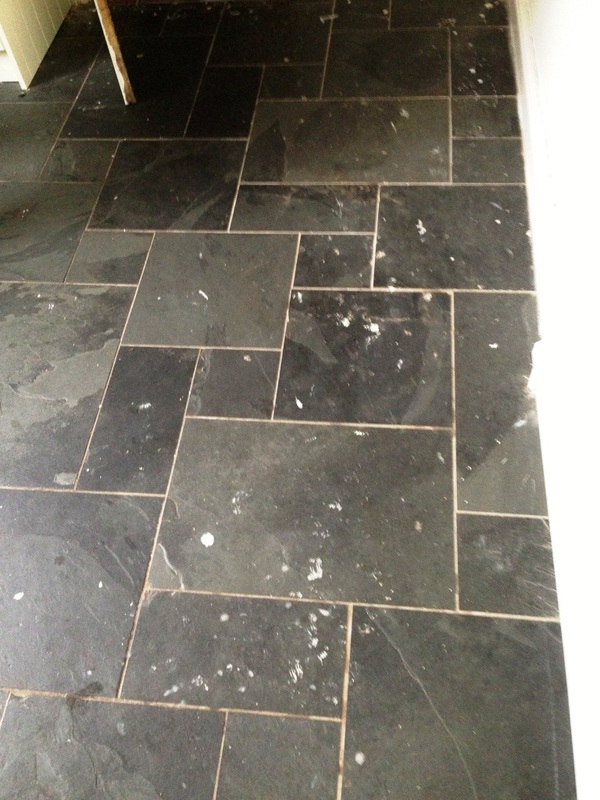 Both my wife and I would not hesitate to recommend Tile Doctor & Jozsef. If your hiring a decorator beware, for some reason were seeing an increase in floors splattered with paint due to a lack of care. 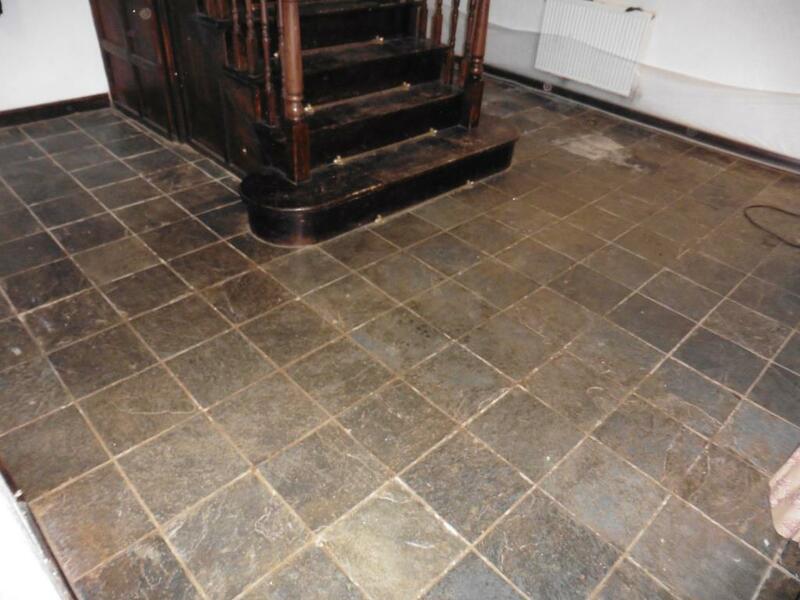 This was certainly the case on this Riven Slate tiled floor in Bury, Greater Manchester where decorators had made a right mess of this floor with plaster and paint. 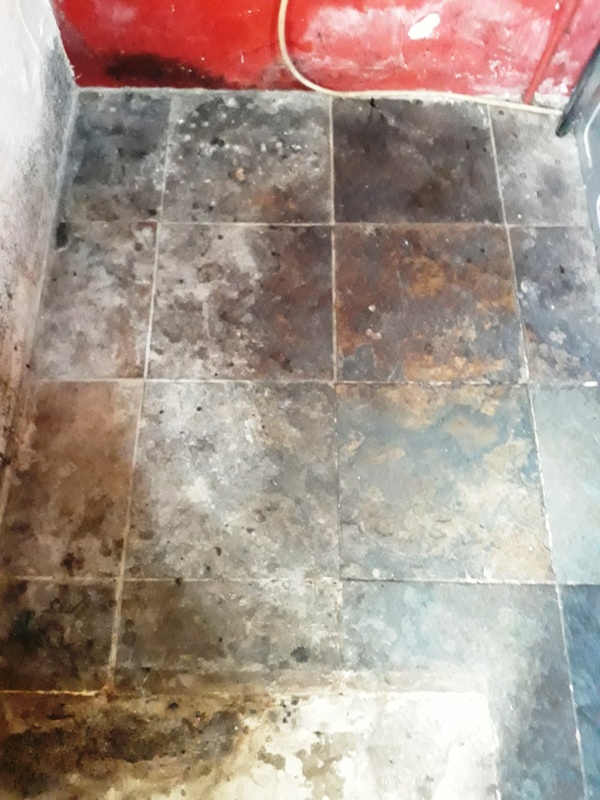 I started the cleaning process by applying a strong dilution of Tile Doctor Pro-Clean which is a multi-purpose cleaner/stripper safe to use of natural tile and stone. The Pro-Clean was left to soak in for a while before being worked into the floor with a rotary machine fitted with a black pad; this worked well and removed all of the plaster and most of the paint. The remaining suborn paint spots were dealt with individually by applying Tile Doctor Remove and Go which is a specialist coatings remover. The last step was to rinse the floor down with water three times in order to wash away any remaining chemical and neutralise they floor before sealing. I left the floor to dry overnight and came back the next day to seal it using five coats of Tile Doctor Seal and Go which provides good stain protection and a low sheen finish. 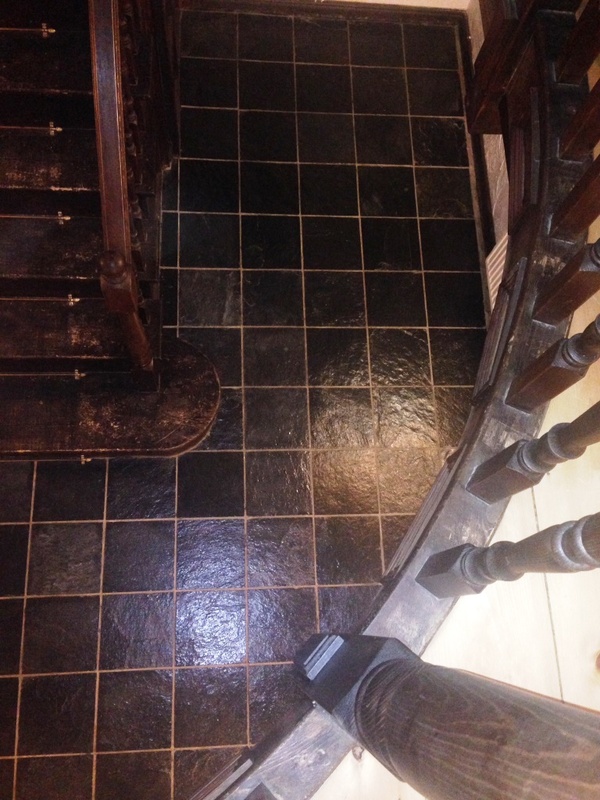 You can see from the photographs the improvement in the floor.